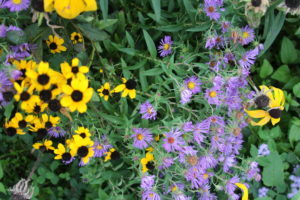 Thanks to everyone who came out on September 20 to see the Farm Hub’s native meadow trials. 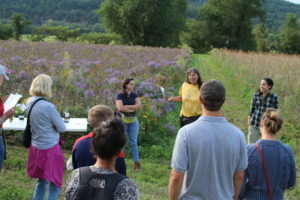 Anne Bloomfield, the Farm Hub’s farmscape ecology coordinator, along with Claudia Knab-Vispo, Erin Allen, and Conrad Vispo of Hawthorne Valley’s Farmscape Ecology Program, led the participants through three kinds of meadows replicated in three locations. Two years since seeding, they also shared research and observations of the three meadow types: a native grass type, a flowering perennial type, and a control plot with the same management minus the seeding. Special thanks to the The Xerces Society for help with seed selection.